What is Financial Planning? How much should I save for Retirement? Led by Keith W. Patterson, Post Oak Capital Group's experienced Sugar Land financial professionals provide a comprehensive range of retirement, estate and long-term planning services to clients across Greater Houston and beyond. Although we focus on the needs of clients aged 45 to 65, we can address the needs of clients at every stage of the financial journey. The goal of a financial plan is to generate superior return on one's assets while mitigating risk and accounting for one's specific needs, goals and special considerations. It involves careful analysis of one's current assets and earnings as well as a comprehensive look at one's future financial needs, such as the need to provide for one's heirs or maintain a certain lifestyle in retirement. Lifestyle & Money Management Strategies: This type of financial strategy ensures that clients have ample resources and cash flow to meet their short- and medium-term needs while enjoying the lifestyle to which they have become accustomed. In pursuit of this goal, we architect specific asset management strategies that involve non-discretionary equity trading (conservative and aggressive portfolio mixes based on clients suitability), mutual funds, municipal and corporate bonds, and stock technical analysis that identifies optimal entry and exit points. Retirement & Estate Planning Strategies: We help you ensure that you have ample resources to live comfortably through your later years and bequeath your hard-earned assets to your heirs in a tax-efficient manner. We assist you to employ such tools as IRA rollovers, tax-deferred annuities, life insurance, retirement income planning strategies and estate planning analysis. Retirement occupies a special place - and causes a special amount of worry - in the minds of many Houstonians. As any experienced Sugar Land area retirement pprofessional will tell you, however, there is no "correct" answer to this question. Your ideal retirement savings target depends on a variety of factors, including your life expectancy, lifestyle needs, the needs of any dependents or adult children, and how you wish to pass on your assets after your death. 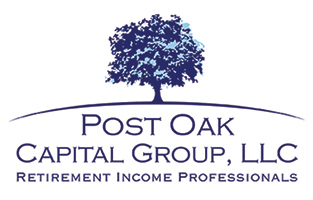 To learn more about the Sugar Land area fee based financial planner services offered by professionals at Post Oak Capital Group, explore the subpages on our website. For a no-obligation financial review, fill out the onsite contact form or call (713) 960-6949.